Read Happy Baby Organic Guide Book. Many of you know that P’Diddy is my third baby. And somewhere in the five and a half years between him and his brother is the time where I became a Crunchy Mama. One of the characteristics of being crunchy is buying and eating organic. So when P’Diddy was close to six months old it was time to start researching what he was going to eat. A lot had changed in those five years! A whole new market emerged. Or maybe I was just seeing it for the first time. 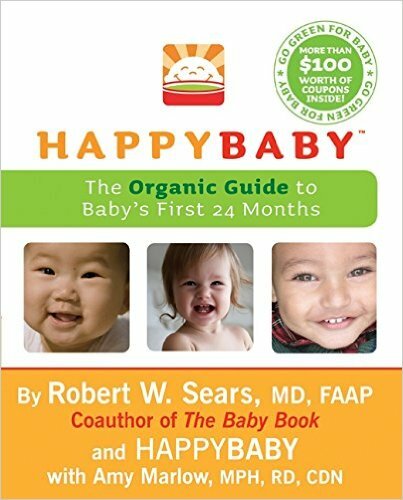 I was very excited when Happy Baby food wanted to send me their new book called The Organic Guide to Baby’s First 24 Months by Robert W. Sears, MD, FAAP (yes Dr. Sears!) and Amy Marlow, MPH, RD, CDN. It is a really great book! It goes from how to prepare for baby before he comes, to the main part of the book which is a guide on eating, then finishes up about how to green up your whole life! But how green do you really want to go? There are different levels to help you achieve your goal in each area in the book and in life! The deepest shade of green – for mamas who are ready to take the bigger steps. In this post I want to talk a bit about the eating/foods part of the book. On Wednesday I will write about other parts of being green that the book focuses on. It would be impossible for me to talk about all 400 pages but I want to key in on some of my favorite sections. How about Avocado and Apple? Or Baby’s First Burrito – Black Beans & Banana. They have lots of recipes for the whole family too! A part I enjoyed reading word for word, seriously studying, was the part about how much a baby should be eating at what age. And not just how much, but WHAT to introduce and when. A big question in our house is when to introduce dairy. Hubby is not a big fan of cow’s milk so we haven’t done any yogurts or cheeses yet. Of course every baby is different, so always take that into consideration when reading these things. It was just a few months ago that I headed down the baby aisle for the first time after many years to pick up some “real” food for P’Diddy. Wow was it overwhelming! 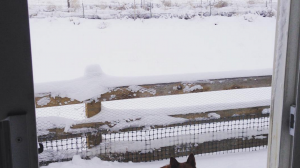 What was safe for him? There are some great tips listed in The Guide – “all natural” doesn’t always mean “healthy”, “made with organic” doesn’t mean 100% organic, a “made with real fruit” might still mean processed sweets. Everything in the book are great tips for all of us. Yes, they may start with baby, but we should be following them for the rest of our life if we want to remain healthy and eco-friendly at the same time. All their packaging is BPA free and everything purchased contributes to their Project Peanut Butter which feeds starving children in Malawi. You want to hear what my boys tried? This was the first snack food P’Diddy tried. Do you know what I call them? The crabby stoppers. They have to be stocked in our house! How about some green puffs? Or gluten free sweet potato? The snack that everyone RAVES about. And I have to admit – they are pretty tasty! Also come in banana and strawberry! This was a fun one. P’Diddy’s first meats! Turkey, vegetables, fruits & millet. Does Beef Stew sound yummy? Or how about Amaranth Ratatouille? Can you even say that? One for my big boys! They love fish sticks so to find some that I know are healthy is fantastic! There are some hidden vegetables inside too! Mac & Cheese is another favorite! Or Veggie Tots! So happy to have found not only a great Guide to teach me but healthy organic food that tastes great! Would you like to read The Organic Guide to Baby’s First 24 Months? Happy Spring Break Starbucks Giveaway! I'm a follower and it could help me get my 4 yr old to eat some veggie other than only broccoli! So excited to see this. Petey is 7mo. not very interested in solids yet, but I'd love to get some new ideas. Always looking to deepen my shade of green!! like happy baby on FB- amorette d.
like you on FB- amorette d.
follow you via GFCat 11 months we are struggling to get my son to eat food. he really really loves breastfeeding. hopefully the books will have some helpful tips. Millet is a seed. When I was a child my pet parakeet loved it. I'm a follower. It could help my kids eat healthier! Happy Baby can help me by helping me to get more veggies into my little guy. He has been resisting eating them lately! Happy Baby already helps us! Puffs are a staple in our house now!!!! They look like healthy snacks my twins would enjoy. Those happy melts look pretty tasty.